The “Oolta-Poolta” South African googly group was virtually disbanded after the Australian tour of 1910-11, and although Schwarz was a member of the squad that went to England to participate in the Triangular Tournament of 1912, he was clearly past his prime. Even though he was still a batsman to reckon with, Faulkner was not the success in 1912 that he was in Australia. With the onset of World War I, Reggie Schwarz served in German South-West Africa, winning a Military Cross. Later in the war, while a Major in the 6th Battalion, King’s Royal Rifle Corps, he was wounded twice in France and was mentioned in Despatches. Although he had survived the hostilities of the war, he had to be admitted in a hospital with broncho-pneumonia on the day the Armistice was signed. Unfortunately, he succumbed to his medical condition seven days later, on 18 Nov/1918, aged about 43 years, and was laid to rest at the Etaples Military Cemetery in France. It was discovered after his death that Schwarz had left his friend Bernard Bosanquet a bequest of £ 1,000 in his will, and when Bosanquet’s son was born in 1932, the child was named Reginald. Faulkner’s military career began with the Boer War, and he was in the thick of the action as a gunner attached to the Imperial Light Horse at the relief of Mafeking and Ladysmith. At the onset of World War I, Faulkner enlisted in the British Army and was attached to the Royal Field Artillery. He saw action in France and in Macedonia. While in Palestine, Faulkner was involved in the capture and defence of Jerusalem. He was awarded the Distinguished Service Order and the Order of the Nile. 4th Class. On a personal front, the course of his marital alliances, however, was not as smooth as he would have liked. At end of the Triangular Tournament of 1912, Faulkner found himself at the end of his Test career. He was, however, still highly rated, both for his forceful batting, as well as for his deceptive spin bowling. By the time the 1921 Australians arrived in England under the formidable Warwick Armstrong, first class cricket in England was not at its best, the War having depleted the younger talent pool and many of the senior players having retired. Consequently, the Australians began to dominate the series to the extent that rumours began emanating from their camp of a promise of a bonus of £ 1,000 per player if the team could go through the tour undefeated. There was one Englishman, however, who was not amused by the rumours, and who was quite convinced that the tourists could be beaten on the cricket field. Archie MacLaren, the Lancashire veteran, then aged about 49 years, believed he had the man for the job. 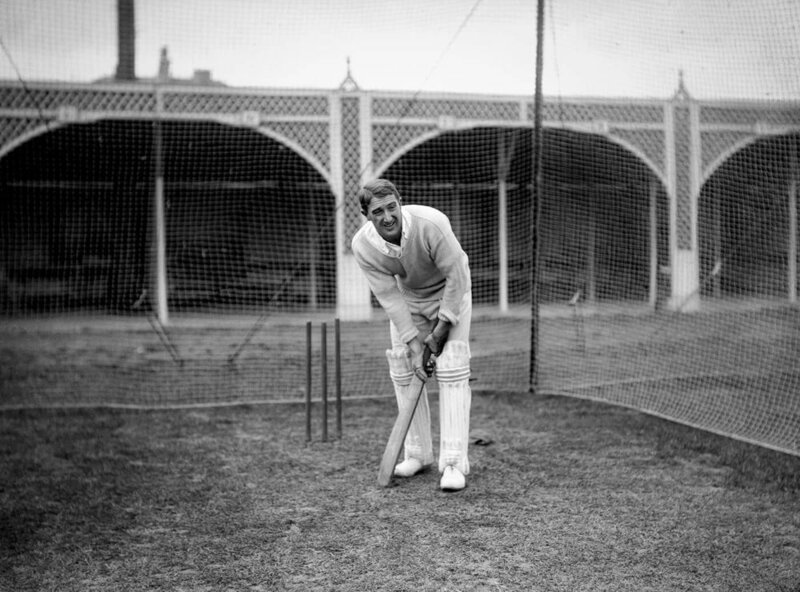 He formed an England XI to take on the tourists in a first-class fixture at Eastbourne, from 27 Aug/1921, and included the 40-year old Faulkner in the playing XI. The England XI batted first and were dismissed for 43 in 20.1 overs, only Percy Chapman (16) reaching double figures. The wickets were divided between Ted McDonald (5/21) and skipper Armstrong (5/15). The Australians, in turn, were dismissed for 174 in the 1st innings, with Bardsley (70) scoring the only fifty. The veteran Faulkner had figures of 4/50. When the home team batted in the 2nd innings, the total of 326 all out was made possible by a majestic century (153, with 21 fours) from the bat of Faulkner. The Australians scored 167 all out in the 2nd innings, Faulkner capturing 2/13 from his 5 overs. Well, skipper Archie MacLaren proved his point and won the match 28 runs, Faulkner doing a magnificent all-round job for the team. Resigning from his teaching job, Faulkner began a cricket school in Richmond in 1925, the first of its kind in England, and threw himself into the task of coaching the next generation of English cricketers. The story of his financial tribulations and of his troubled mind has been told many times over. Similarly, the gory details of his much- publicised suicide on 10 Sep/1930 is well-known to all and needs no elaboration here. When the world was engulfed in the Armageddon of 1914, 230,000 South Africans enlisted for war service, a surprisingly high percentage from their population of about 6.4 million in 1914. By the end of the War, South Africa lost at least 12,452 men, many of them highly skilled sportsmen and women. Gordon White enlisted with the South African army and served in the East African Campaign of 1916-17. Joining the 160th Brigade in Egypt in March/ 1918, he was wounded in a bayonet attack near Jerusalem on 10 Sep/1918. Treated at the 47th Stationary Hospital at Gaza, he succumbed to his injuries on 17 Oct/1918, and was buried at Gaza. The only one out of the South African “Oolta-Poolta bowlers to reach a reasonable age was Bert Vogler. While his fellow-men were playing against the Englishmen and the Australians in the Triangular Tournament of 1912 in England, Vogler, not selected for the tour, moved to England on private business, and played club cricket in Scotland and Ireland. In 1919, he played 14 games for the Lancashire League team Rishton. Vogler invited to play in a first-class game for LJ Tancred’s XI against PT Lewis’ XI at the Old Wanderers from 30 Dec/1911. Thanks to the forceful batting of Dave Nourse (147) and Tip Snooke (105), and the exceptional bowling of Vogler (7/96 and 3/73), the match ended on the second day with Tancred’s XI winning by an innings and 71 runs, and the teams were able to accommodate a light one-day game on the scheduled last day of the match. Vogler’s last first-class appearance was for Woodbrook Club and Ground against the South Africa team that was in England to play the Triangular Tournament of 1912. The game took place at Bray, Ireland, from 22 Jul/1912. In a drawn game, Vogler scored 9 runs and took 2/117 and 3/56. Bert Vogler breathed his last on 9 Aug/1946, aged about 69 years, at Fort Napier, Pietermaritzburg, Natal. Before we bring the current narrative to a close, it may be worthwhile to have a glimpse at the brief career figures of the South African “googly quartet” of the early 1900s. In a first-class career spanning 1901 to 1914, Schwarz played 125 matches, scoring 3798 runs at 22.60, with a highest of 102, his only century. He also had 20 fifties and held 107 catches. He captured 398 wickets at 17.58, with best figures of 8/55, 25 five-wicket hauls, and 3 hauls of 10 wickets in a match. His overall economy rate was 3.09, his strike rate being 34.05. These figures include 20 Tests played between 1905/06 and 1912, with 374 total runs at 13.85, a highest of 61, his only fifty, and he held 18 catches. He took 55 Test wickets at 25.76, with best figures of 6/47, and 2 five-wicket hauls. His Test economy rate was 3.22, and his strike rate was 47.98. In a first-class span of 1902/03 to 1924, Faulkner played 118 matches, scoring 6366 runs at 36.58, with a highest of 204, 13 centuries, and 32 fifties. He held 94 catches. He captured 449 wickets at 17.42, with best figures of 7/26. He had 33 five-wicket hauls and had 10 wickets in a match 8 times. His overall economy rate was 2.82, his strike rate being 37.02. These figures include 25 Test matches played between 1905/06 and 1924. He scored 1754 Test runs at 40.79, with a highest of 204, 4 centuries and 8 fifties, and held 20 catches. His Test wickets number 82 at 26.58, with best figures of 7/84, and he had 4 five-wicket hauls. His Test economy rate was 3.09, his strike rate being 51.54. Between 1902/03 and 1912, White played 97 first-class matches, scoring 3740 runs at 27.70, with a highest of 162*, 4 centuries, and 17 fifties. He held 46 catches. With the ball, he had 155 wickets at 20.05, with best figures of 7/33. He had 8 five-wicket hauls, and captured 10 wickets in a match twice. His economy rate was 3.50, and his strike rate was 34.34. These figures include 17 Test matches between 1905/06 and 1912, where he scored 872 runs at 30.06, with a highest of 147, one of his 2 centuries. He also had 4 fifties and held 10 catches. His 9 Test wickets cost him 33.44 runs each, and his best figures were 4/47. His Test economy rate was 3.62 and his strike rate was 55.33. Between 1902/03 and 1912, Vogler played 83 first-class matches, scoring 2375 runs at 20.29, with a highest of 103, his only century. He had 8 fifties and held 81 catches. He captured 393 first-class wickets at 18.27, his best figures being his 10/26. He had 31 five-wicket hauls and captured 10 wickets in a match 7 times. His first-class economy rate was 3.28, with a strike rate of 33.34. These figures include Vogler’s 15 Tests in which he scored 340 runs at 17.00, with a highest of 65, one of his 2 fifties. He held 20 catches. He took 64 Test wickets at 22.73, with best figures of 7/94. He had 5 five-wicket hauls in Tests, and captured 10 wickets in 1 match. His Test economy rate was 3.15 and his strike rate was 43.18.